A native of Montreal, Quebec, François Methot was a 3rd round NHL draft pick of the Buffalo Sabres in 1996 out of the Quebec Major Junior Hockey League (QMJHL). He began his QMJHL career as a 16-year old with the St. Hyacinthe Lasers for the 1994-95 season. In just his 2nd QMJHL season, Methot registered 94 points in 68 games and leading the Lasers in scoring as a 17-year old. Following that season the Buffalo Sabres made Methot their 3rd round pick in the 1996 entry draft and made his professional debut with the Rochester Americans of the American Hockey League (AHL) during the 1998-1999 season at the age of 20. Methot spent the the first five seasons of his professional career with the Amerks, playing in 334 regular season games with the club and another 39 Calder Cup playoff contests. After a season with the Portland Pirates in the AHL, Methot moved on to a very successful career in Europe until he retired from playing professionally. Upon retiring following the 2014-2015 season after a 17-year professional playing career he returned to Rochester full time and immediately was brought on by the Rochester Monarchs AAA Hockey Club as their Director of Hockey. Methot has continued to develop his knowledge of the game even after completion of his playing career. 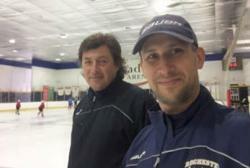 This past summer he spent time in Arizona at the elite skating camp of renowned power skating coach Boris Dorozhenko of Next Generation Hockey schools. Methot has brought this system and philosophy back to Rochester to work with players of the area. Dorozhenko’s reputation became known nationally this spring as one of his longtime students, Auston Mathews, was selected overall #1 by the Toronto Maple Leafs in the 2016 NHL draft. Dorozhenko worked with Mathews from the time the Leafs prospect was seven years old until Matthews moved onto the US National Team Development program U-17 and U-18 teams. Coach Methot is excited to bring an expanded set of skating and hockey skill instruction and development to players of all ages throughout the Rochester area. She offers unique expertise with proprietary drills that increase speed, develop confidence, strength, power and agility. Erika's goal is to develop top level athletes and mentor each player to reach their goal. Erika has 18 years of competitive figure skating training. She competed at the State, Regional and Eastern US Championship levels, with medals at the Regional level and Gold at the Empire State Games Championships. Erika is a USFS Double Gold Medalist in figures and freestyle. She has her BA in Communications from St. John Fisher and earned educational credits from PACE seminars through the Professional Skater's Association. Erika has developed and worked with some of the area's best players. These players are currently playing in The National Team Development Program (NTDP), Prep Schools, Division I and III Colleges, NAHL, USHL, BCHL,OHL, Women's National Team, JR A, and JR B.
Erika has 25 years of teaching experience. Coach Patterson grew up playing minor hockey in his hometown of Potsdam NY. After leading his Bantam Major team to the state semifinal, Patterson played three seasons for Potsdam High School, winning a Section X title as a freshman. He attended Wyoming Seminary Prep School in Kingston PA for a single season, before leaving prep school for the junior ranks while still a senior. Beginning the season in the EOJHL (now CCHL2), Patterson earning a roster spot mid-season for the Kanata Stallions of the CJHL as a 17 year old. After playing two more seasons of juniors in both the US and Canada, Patterson attended SUNY Canton for two years as they transitioned from a nationally ranked ACHA program to a member of NCAA Division III. He then transferred to the University of Rochester, and captained the Yellowjackets to two UNCYHL championships in three seasons. Following graduation, Patterson joined the Rochester Monarchs organization, first as an assistant coach for the Monarchs Bantam Minor Blue team, before joining the coaching staff of the Bantam Major Gold. He is now the Monarchs 06' team Head Coach. Brian played his high school hockey both JV and Varsity for Fairport High School after graduating in 2010 he moved to Boston to play Jr's for the South Shore Kings. Brian then started coaching JV hockey for Fairport in 2012 and won a championship with that team in 2015. After that, he moved up to work with the Varsity program at Fairport in 2015 helping them reach the sectional finals the same season. Currently he is the assistant coach for the Rochester JR Monarchs NCDC team. College: Played at RIT for four years- DIII for the first three years, DI my senior year. Named the 2011 PAYCHEX Rochester Female College Athlete of the Year. CCM/Old Time Hockey First Team All-American honors. 2011-2012 All-ECAC West first team accolades. 2011-2012 NCAA Championship All-Tournament team. 2011-2012 Won the DIII Women's Hockey National championship. Played in 124 career games. Tied for second all-time at RIT among scoring by defensemen with 80 points. In Casey's last season in the Rochester area, he played with the Rochester Monarchs 16U AAA team for Coach Ryan Gage. While playing for the Monarchs, he also played for Webster Schroeder and was a key defensive cog in their run to the first ever State Championship hockey title for the School. Casey was named Defensive MVP in the Section V Championship game. Following that season with the Monarchs and Webster Schroeder, Casey moved on to Trinity-Pawling in the New England Prep Founders League. He played 2 seasons; the 1st under Rob Hutchison (now at Skidmore College, NCAA DIII) and the 2nd under Robert Ferraris (formerly Associate Head Coach with Mercyhurst, NCAA DI). This season Casey played Tier I Jr A Hockey in the CCHL for the Nepean Raiders under Coach Darcy Findley where he played in all 62 regular season games. Ryan played with the Rochester Monarchs during his Bantam years and as a 1st year Midget. After his Bantam Major season, Ryan was selected to participate in the USA Hockey Select 15s Camp. During his only season in Rochester as a Midget, he played along side his brother Casey on Coach Gage's team as well as on the State Champion Webster Schroeder Hockey team. As a sophomore, he was named to the All Tournament team in the HS State Tournament and received Honorable Mention for All Greater Rochester. Ryan moved on to Trinity-Pawling in the New England Prep Founders League where he played 3 seasons and is currently a senior. Ryan has committed to play NCAA DIII hockey next season for Bowdoin College in picturesque Brunswick, ME under Coach Jamie Dumont. Ryan excelled in baseball as well and is also committed to Bowdoin College's baseball program.